On Monday night, November 24, St. Louis County Prosecutor Bob McCulloch made an announcement that surprised no one although it disappointed many. A grand jury had declined to indict Ferguson, Missouri, police officer Darren Wilson in the killing of 18-year-old unarmed Michael Brown. 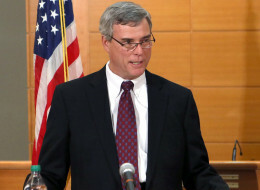 Robert McCulloch giving a press release about the grand jury’s findings. AP Photo. Within days of the August 9 shooting, McCulloch’s refusal to bring charges against Wilson and his effort to hide behind a grand jury had met with widespread criticism and disdain. Jeryl Christmas, a former prosecuting attorney in the city of St. Louis and a defense lawyer, called McCulloch’s handling of the grand jury “a charade” designed to avoid charges. It’s nearly unheard of to present evidence to a grand jury without recommending charges or explaining how the evidence justified the charges. Nor is it customary to present justifications for the perpetrator’s actions, as McCulloch did. These actions betray extralegal motivations. Race was the central issue behind the prosecutor’s charade. The murder of Michael Brown served as a tipping point in a long history of police violence against Black youth, and touched off weeks of protests that culminated in a nationwide march on St. Louis in October and exposed a culture of racist, predatory policing rampant in metro St. Louis and elsewhere. As the grand jury proceedings dragged on, justice advocates held a series of workshops on nonviolent protesting in Ferguson and St. Louis. Protest organizers negotiated “terms of engagement” with police and mayors. The St. Louis area descended into anticipatory paranoia. Store owners, even in areas miles away and worlds apart from Ferguson, boarded up windows. School districts prepared to close schools so that students didn’t get caught in violent disturbances. Dentists even made arrangements to use offices in other counties and moved patient visits out of St. Louis. Everyone, it seemed, expected McCulloch’s office to fail to indict a killer cop. Everyone accepted that the community would be outraged by that failure, and many people feared the outrage would turn violent. When it came time to finally announce the grand jury’s decision, McCulloch opted to inflame tensions even more. In a tone heavily weighted with condescension, he began his speech by criticizing news organizations and social media for daring to discuss the killing without all the facts. He attempted to lecture the public about the importance of inconsistencies in witness statements over time, while ignoring inconsistencies in the versions of events that came from the Ferguson police department and Darren Wilson (others have written on how unbelievable Wilson’s testimony was). Then, McCulloch tried to lecture everyone on the importance of contradictions between witness statements and physical evidence, while ignoring those between Wilson’s testimony and the physical evidence. Wilson, for example, testified that Michael Brown was only 20 feet from Wilson’s car and charging when Wilson fired the shots that killed him. The physical evidence shows that Brown was 135 feet from the car. McCulloch also said that Wilson stopped Brown because he fit the description of a suspect in a convenience store robbery, even though that contradicts repeated statements from the Ferguson police department and Wilson’s own testimony. Inconsistencies are common in witness statements, but for McCulloch, the only inconsistencies that matter are the ones from African Americans who mistrust the police. After announcing that the grand jury returned no indictment, McCulloch issued a generic, feel-good call to the community to work on issues to make sure such tragedies are not repeated. Under questioning, however, it became apparent that his call was a veiled form of blaming the victim. When asked what “issues” he meant, and what changes he would recommend to policing, he said he would never second guess a police officer. Then, completely ignoring the several exposés of predatory policing in St. Louis County, which showed that police targeted African Americans for enforcement of minor “nuisance” laws, criminalized minor infractions like jay-walking, and turned fines into debts and jail time, McCulloch said that by issues he meant those that placed [African American] men in situations where the police could shoot them! His performance left little room to wonder why the grand jury did not return an indictment. In preparation for McCulloch’s press conference, a coalition of groups acting as Ferguson October had sent out text messages calling for people to assemble at Shaw and Grand Avenue in south St. Louis. That was in the Shaw neighborhood where an off-duty, white, St. Louis cop had gunned down 18-year-old Vonderrick Myers on October 8. Another group of protesters gathered in Clayton, across from barricades set up in front of the County Justice Center, where McCulloch staged his performance. Several hundred other protesters gathered in front of the headquarters of the Ferguson Police Department. Riots erupted in Ferguson after McCulloch’s announcement. In Shaw, a multi-racial group of about 300 protesters, most under the age of 30, marched south on one of the city’s main commercial streets to the South Grand business district, then turned around and marched north again. However, instead of marching to St. Louis University or through the city’s nightclub district as previous marches had done, the march leaders took the throng down an entrance ramp to I-44 where they stopped traffic in both directions of the eight-lane highway. Protestors occupy I-44 at Grand Avenue and block traffic. AP Photo. Many in the south St. Louis crowd pulled out phones and began texting, tweeting, or calling friends to relay the news that they were blocking the highway. The crowd quickly swelled to over 500, with about half the protesters occupying the pavement while the other half chanted from the highway embankment. It took the police time to react. They had to divert traffic and back most of the blocked traffic out in order to move up vans and cars full of police in riot gear. 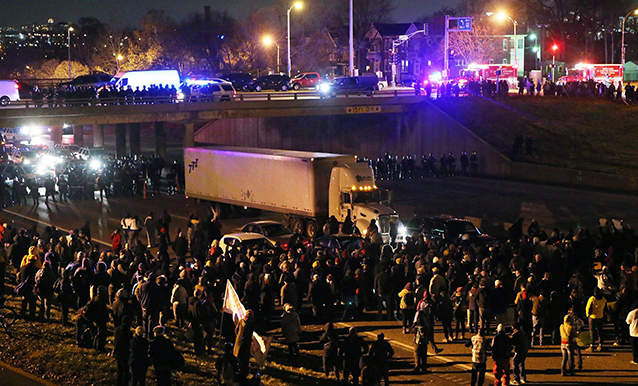 Over half an hour passed before riot police lined up across the Interstate under an overpass. Then they waited for more police to clear the overpass and the embankments on either side and for the arrival of an armored vehicle and lou speaker. By the time they warned people to clear the road, the highway had been shut down for almost an hour. When the police ordered protesters to clear the road, march leaders led them off the highway and back up the entrance ramp to assemble again in the middle of Grand Avenue. When the police ordered them to disperse, they instead marched south again towards the South Grand business district. Many of those who had spent an hour on the highway in subfreezing wind chills drifted away, but a steady stream of new protesters arrived to replenish the numbers of those marching. St. Louis police, who stayed put at first to make sure the highway was secured and open, later caught up with the protesters and clashed with them at about 1 a.m. in the South Grand business district. The police raided “sanctuaries” and fired gas canisters at a coffeehouse serving people who had been in the protest, and windows of about half-a-dozen businesses were smashed. On Tuesday morning, clergy in a protest organized by Metropolitan Congregations United blocked six intersections in downtown Clayton, the county seat, during morning rush hour. A couple of hours later, Color of Change led another protest through Clayton. At noon, several hundred more people turned out in downtown St. Louis for a march to the federal courthouse called by Ferguson October. The variety of groups calling protests illustrates the movement’s chaotic nature that, at the moment, is both a strength and a weakness. Numerous activists groups have emerged such as Millennial Activists United, Hands Up, Black Lives Matter, and so on. They are getting crucial help from already established groups, such as the Organization for Black Struggle, Veterans for Peace, the American Civil Liberties Union, and Amnesty International. The breadth and diversity of the leadership deprives the police of a single target, but the intensity of the actions cannot likely be sustained for long. 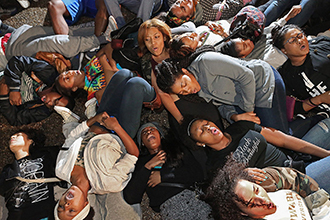 Demonstrators stage a “die in” outside the White House following the announcement in Ferguson. So far, protest leaders have shown tremendous creativity and organization. They have compelled the same government that once arrested bicyclists and raided the homes of anarchists in order to forestall demonstrations at a Monsanto-led agribusiness forum to recognize that people have the right to assemble in the streets and block traffic as a form of protest. Instead of negotiating how they will accommodate the police and local governments, they are demanding that police and governments accommodate them. And they have taken protests out of the neighborhoods to government and financial centers and the trendy hotspots of real estate development. If it can be repeated, the highway shutdown may turn out to be one of the most effective pressure tactics. Just last month the metro area’s main business booster organizations, including the Chamber of Commerce, in conjunction with real estate developers, launched a new nationwide effort to attract distribution and logistics centers to St. Louis. The companies they want to attract are unlikely to want to locate in a place where protesters are shutting down highways to get action on their demands for racial justice. The killing of Mike Brown was the fuse that lit this movement. The leaders that have emerged have done an exemplary job of making his death about more than just one man. In reaching out to the families of other young men killed by police, they have made the movement about national issues of racial injustice, double standards in law enforcement, predatory policing, and civil rights. Their challenge will be to continue reaching out to keep the movement alive and focused on broad issues, and to continue to creatively put pressure on local capitalists to compel local politicians to make real changes. The author of this report is an activist in the St. Louis area who wishes to remain anonymous. So far as I can tell from this excellent report, the protestors did not, by and large, riot, the police did. This should be stressed, to counter the opposite impression conveyed by the mendacious corporate media.